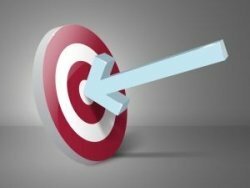 Setting yourself some realistic goals and targets for your new business is essential. As a wise man once said, you are much more likely to hit the target if you know which direction to aim the arrow! In the intial stages of choosing your business, consider longer term goals for 3 years and 5 years. For example, set your income targets and what you want to achieve with your business at each milestone. If you have a firm idea of your business, also consider what your targets for the following might be at each milestone. Not all may apply but it will give you something to consider and plan for. Now you have evaluated your opportunity and have decided to start your own business it is time to set some shorter term goals to focus your initial efforts. If you are just starting out on your home business journey, it is essential that you consider your goals. Research shows that those with goals are far more likely to succeed than those that don?t have any. For example, create a website which will form the centre of my marketing plan. Specify what skills you need to learn and what tools you need to master in order to set it up to include lead capture.